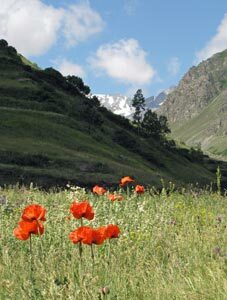 After a couple of days in the tourist-free city of Kayseri following our trek in the Taurus Mountains, we were keen to head back into the Turkish countryside again. 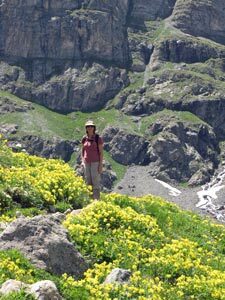 Getting to the Kaçkars from Kayseri proved to be a bit of an epic in itself, due in part to more last minute changes to our itinerary. Ath the end of an uncomfortable 9 hour night trip by bus, we arrived in the city of Erzurum, expecting to be met at the bus station and driven to Yusufeli, the gateway to the southern Kaçkars. 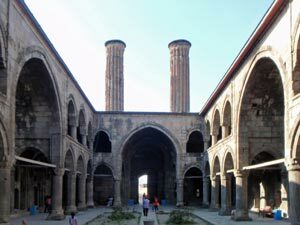 However, no-one showed up and we ended up spending the day and night in Erzurum. 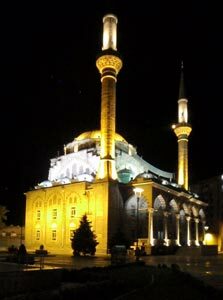 This, in itself wasn’t that bad, as it is an interesting city, with its ancient mosques, madrassas and citadel. 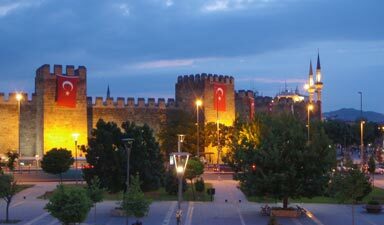 It is also much less westernised than the other Turkish cities that we have visited – for the first time more women were in scarves and coats than in jeans and shirts, and we saw our first burqas. 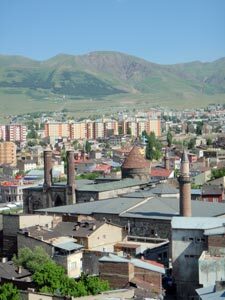 Two indicators of the extent to which western cultural influences have penetrated Turkey are women's clothing and alcoholic drinks - unlike cosmopolitan Antalya, there was no sipping a beer as you watched the world go by in downtown Erzurum. 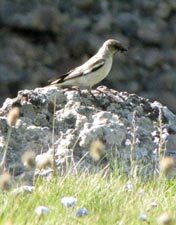 We left Erzurum the next morning on a minibus, heading north across the grassy plains, over some mountains and through a long and spectacular gorge to reach Yusufeli. 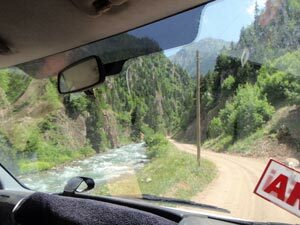 Here we were met and driven by a dolmuş to Yaylalar, another two hours driving, but through some even more spectacular country. 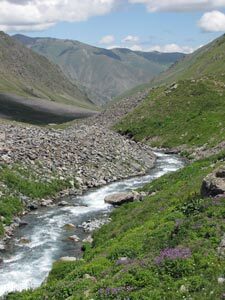 The single lane road changed from paved to rough gravel as it followed the course of the Hevek Dereşi, a ribbon of white-foaming ice green water, swollen with melted snow, as it rushed down from the mountains in a narrow and winding ravine. 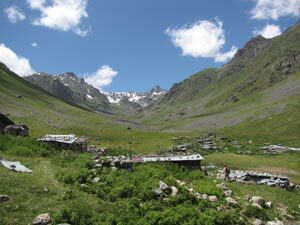 Gradually, the landscape changed from arid to green as we gained height and penetrated deeper into the mountains, until eventually we reached Yaylalar, in its cosy green niche beneath snow-topped peaks. 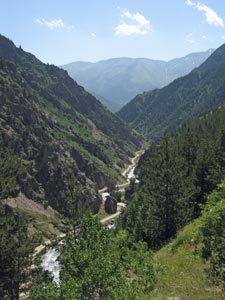 We had arrived in the heart of the Kaçkars, part of the Pontic Coast - a mythical land visited by Jason and his Argonauts in their quest for the golden fleece, rich in the cultures of Byzantine, Armenian, Georgian, Ottoman, Laz and Hemşin, and rich in natural beauty. 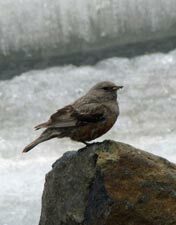 Once installed in our comfortable bungalow next to the rushing stream, the problems of our travels seemed to fade away. The mountains were already weaving their magic. 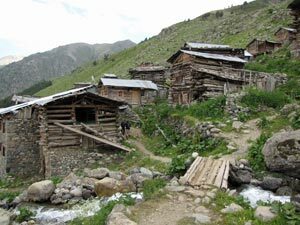 As we had only arrived in Yaylalar in the mid-afternoon, there was only time for short trek on the first day of our Kaçkar adventure. 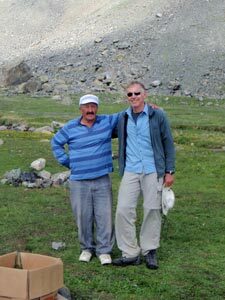 After 6 hours of sitting in minibuses we needed to stretch our legs, so following a late lunch, the fair Nello and I set off from the pension and headed up the Korahmet Valley. 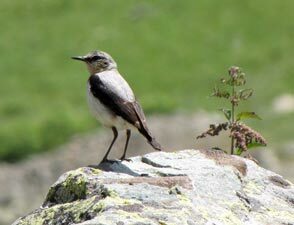 It was ideal for a warm-up walk as you could do it without a guide and turn back at any time. 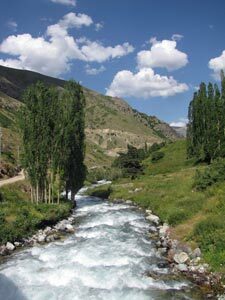 A quick stroll down the road that followed the rushing white water of the Hevek Dereşi brought us to a deep opening of the Korahmet Valley, out of which the equally fast flowing Zamevan Dereşi joined the Hevek. 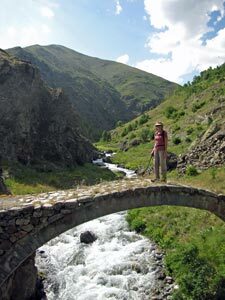 We crossed the stone arch of an old Ottoman Bridge to reach the footpath on the other side that led up the valley. 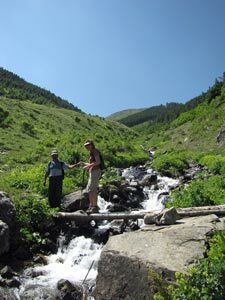 The track climbed up before levelling out to follow the valley round high above the silvery thread of the stream, now deep in the ravine below us. 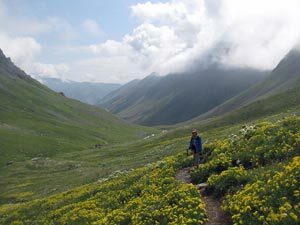 The wildflower-lined path curved around beneath a rocky cliff face, opening out views down the valley toward the 3350m peaks of Lale Tepe. Following the track around to the east, the village of Karamolla with its traditional stone houses appeared. 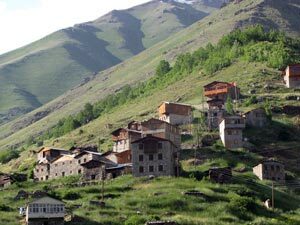 We walked through the village to pick up an overgrown track higher up the slope that led us to the ghost-town like village of Korahmet. Here we stopped as time was getting on and followed the gravel access road back to Karamolla before retracing our footsteps down the path to Yaylalar, framed by snow-tipped green mountains. 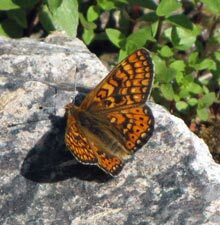 The greenness of the Kaçkars was all the more striking for its contrast with the barren, orange-tan landscapes of the Taurus Mountains, where we had just been. 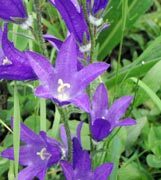 It was a short walk, but gave us a good taste of what lay in store; snow-capped peaks, deep valleys with rushing streams, green meadows and wildflowers in abundance. Our appetite for the next week of walking was well whetted. 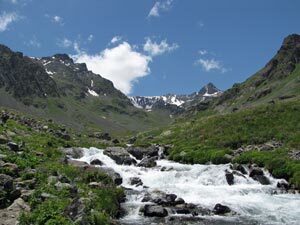 As has been the case since we arrived in Turkey, clear blue skies greeted us on our first real day of walking in the Kaçkars. 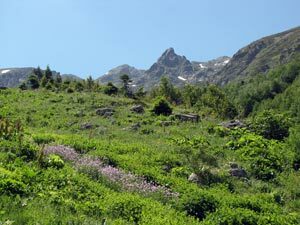 We were planning a walk up to the high slopes behind Yaylalar, from where we could get a grand view of the main range of the Kaçkar Mountains to the north and our eventual goal, the 3937m peak of Mt Kaçkar itself. 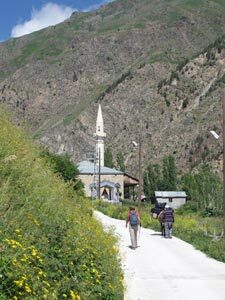 We met our local guide, Ibrahim, at the village store and headed off, climbing up through the village and past the mosque. 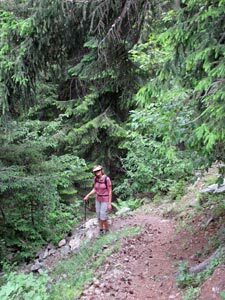 Just on the outskirts, we left the road and climbed up an old mule path, which led us on a traverse across the pine and fir covered lower slopes. 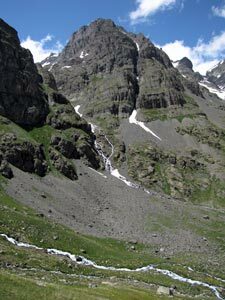 As we pushed on, the white foaming water of the Hevez Dereşi gradually fell further below us. 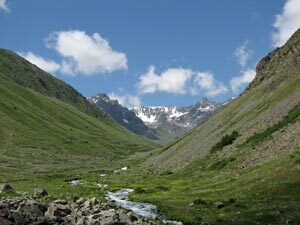 After a long traverse, our route onwards was cut by a deep valley which forced us to take the one direction that we didn’t really want – up! 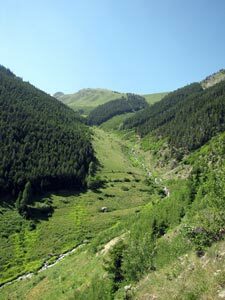 We turned into the valley and the climb to the high slopes began. 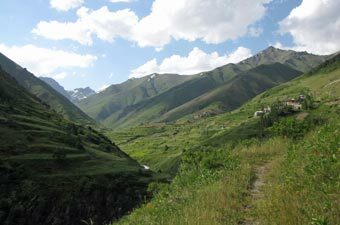 At first we skirted the edge of the forest, before crossing the side stream that tumbled down the steep valley slope and continuing our climb up the flower-speckled grass and herb-fields of Aksav Yaylasi. 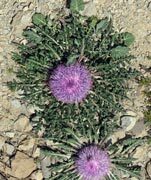 The broad open higher slopes of the Davut Mountains looked down on us, as Ibrahim led us up the faint overgrown track and into a grassy bowl backed by the bare rock wall of the mountain ridge. One more climb, up through some scattered pines on a spur to the east brought us out to a stone cairn and impressive views across the valley towards the Bulut Mountains and the dark 3420m dome of Caymakçur Tepe. 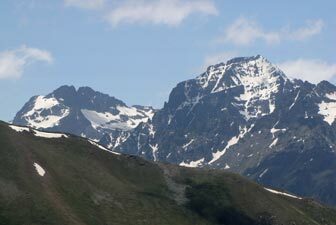 Further to the left, the unmistakable snow-covered south-western face of 3937m Mt Kaçkar was just appearing from behind the green slopes of the range we were on. 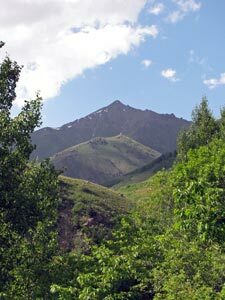 It was a good place for a rest stop and a chance to become a bit more familiar with the profile of these mountains. 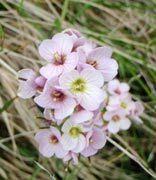 Soon we were pushing on, across a steep slope covered with white- and occasionally pale pink-flowering rhododendrons. 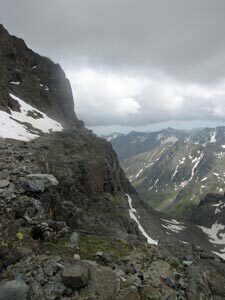 We curved around this slope to cross a clinking boulder scree and climb up to a grassy saddle. Just to our left the rocky knob of Halime Tepe was begging to be climbed. 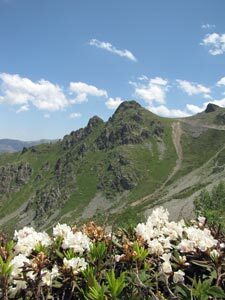 We obliged to reach the high point of the day at 2750m and the visual high point with its 360° panorama of the mountains about us. 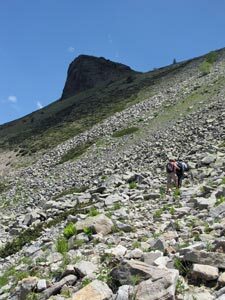 Descending back to the saddle, we pressed on to pick our way carefully down a soft scree slope and reach a narrow saddle between two valleys. 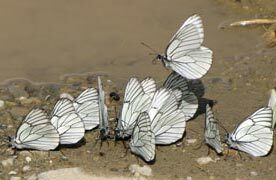 The wind was now picking up, so we sat on the leeward side to have our lunch – soon to be joined by a squadron of kamikaze March flies. 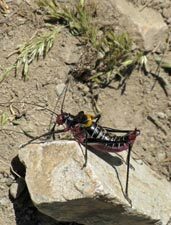 It was the first time we had been bothered by insects on our walks in Turkey. However, they did not distract from the main spectacle of cloud rising up on the northern side of the main range and spilling over into our side through passes and over saddles – an impressive lunchtime display. What we didn’t notice, as we watched the cloud display on the mountains, was the other band of grey clouds creeping up behind. 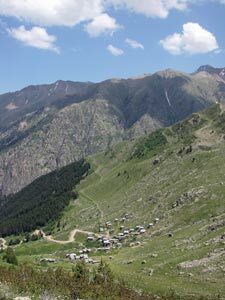 It was time to move on and Ibrahim led us quickly down into the valley high above the stone and wood houses of Modut Yayla, a place where local people spend the 2-3 months of summer. 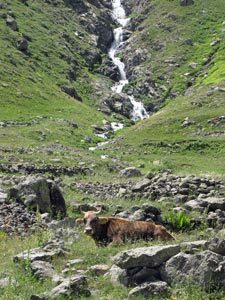 Reaching the upper part of the valley, with its twin silvery streams tumbling down from above, we stream hopped past fields of flowers, included clusters of tiny purple orchids, before descending the rocky yayla pastures to reach the village itself. 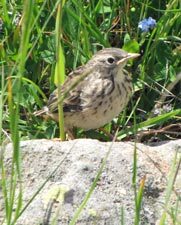 The summer migration had not yet occurred and the village was eerily quiet apart from one person working on some renovations. 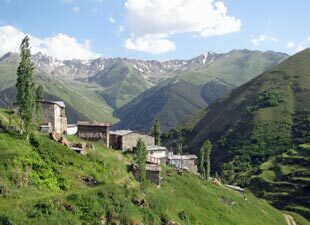 From Modut, we picked up a rough gravel road, descending it with the occasional short cut to pass the smaller yayla village of Sakura, with its outer houses perched on the edge of a formidable drop into the deep ravine of the Hevez Dereşi. The way down for us was the road, with an interminable series of hairpin bends, until Ibrahim found a footpath that not only cured the tedium of the road by passing through shady pine and fir forest, but got us down much more quickly. Opening out to the right as we descended, we could look directly up the superb Mikelis Gorge, with its stream of the same name cascading down in a foam of white-water. 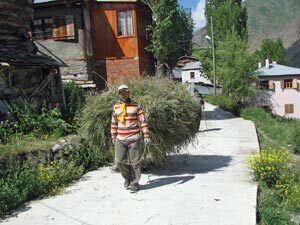 Soon after we passed some terraced gardens and entered the village of Mikelis, very different from the villages above, as it was full of life – men and women working and children playing. We stopped off there for a welcome cup of cay at Ibrahim’s sister’s house, before making the final descent down the narrow concreted access road from Mikelis to the main Yaylalar road, over 1000m below our high point of the day. 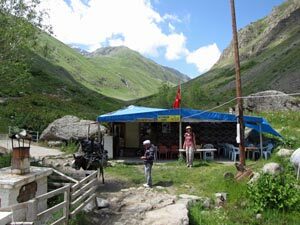 This was supposed to be the end of the walk, and just when we were beginning to think we may have a long walk home up the road, the local dolmuş appeared and we climbed on board for the short drive back to our pension. 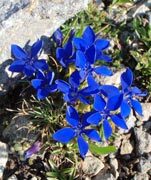 The Kaçkars had delivered on their promise from our short walk of yesterday – spectacular peaks, fields of flowers, deep ravines and valleys, tumbling mountain streams. 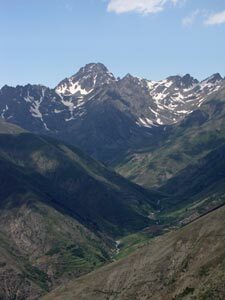 Thanks, Ibrahim for showing us this part of your mountains. 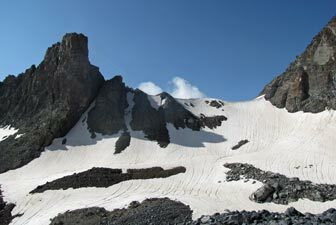 The next step though was to enter the heart of the mountains – a visit to 3937m Mt Kaçkar itself. 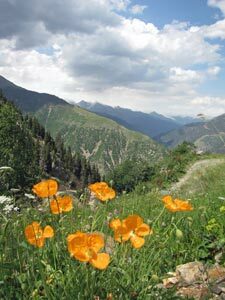 For us, climbing Kaçkar was to be a 3-day expedition; one day to get up to base camp at Dilberdüzü, one day for the climb and the return to Yaylalar on the third day. 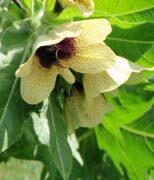 At 6am on the day we were to head off the fair Nello looked out of the window and saw that the cloud of yesterday had settled in and was covering the hills around Yaylalar. 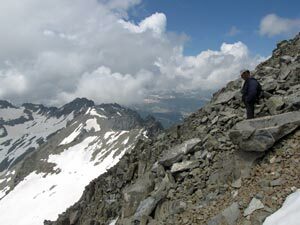 A worry about whether we might not be able to do the climb began to nag, but by 7.30am the sun had burnt holes in the low cloud and by the time we were ready to go, it was a beautiful day – blue with big fluffy clouds drifting by. We met Makşur, our guide, mule driver and cook, at the store. Soon he had the mule loaded up with our camping gear, plus tents and cooking gear, even a small table and chairs, and we were off. 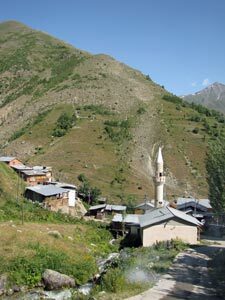 Again we headed up the street and past the mosque, but this time we kept on the concrete road that soon had us heading gently westwards up the valley towards the hamlet of Olgunlar. It was a busy road, women tending their gardens, men scything the thick herb-fields for hay, mules passing by almost obscured by their loads of fresh hay for storage in the barns, kids wandering off to school. It was the season of the harvest – time to lay up supplies for the animals during the long cold winter ahead. 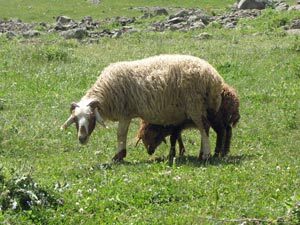 The road changed to gravel and crossed the rushing stream, leading us into Olgunlar with its stone and wooden houses and a small open-air café, where we stopped for a cup of çay and a chance to enjoy the lush green valleys of the Kaçkar. 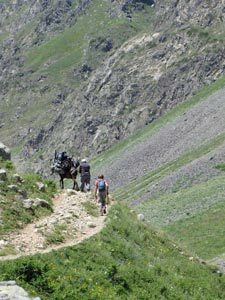 Pushing on, we now followed Makşur and the donkey onto a nice footpath that headed up Büyük Valley, the road to Mt Kaçkar. 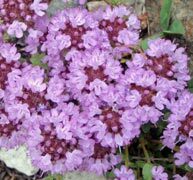 It was a long and beautiful glacial valley, a green canvas of grass and herb-fields spattered with the whites, yellows, blues, pinks, purples and oranges of their flowers. 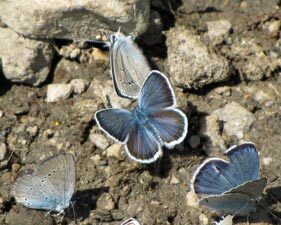 Butterflies flitted by, grasshoppers crossed the path and the faint song of the ground lark could be heard above the sound of the rushing stream, as it tumbled over rock and boulder. Our mule was enjoyed the moving buffet of different tasty herbs and grasses as we slowly headed up the valley. Rounding a curve, we could see the snow-capped ridge of the main range and started to head directly for it. 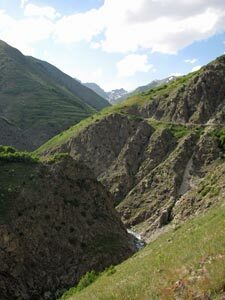 After passing through the empty houses or crumbling stone ruins of Hasta Yaylasi with its low stonewalled fields lining the stream, the climb started to get steeper. 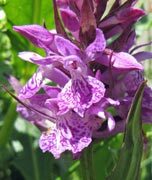 We crossed a boggy area, full of purple orchids and pink flowering herbs to reach a broader plateau. 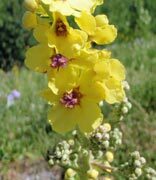 The flower fields were becoming denser, with thick clusters of yellow and white blooms providing a superb foreground to the dark walls of the mountains rising behind them. 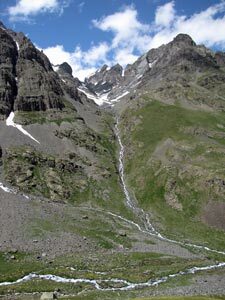 We were now well into the upper valley and the mountains had begun to enclose us, silvery streams flowing down from the heights. We were starting to feel quite hungry, but our guide/cook was keen to get to the campsite and set up before eating. 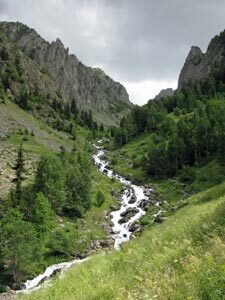 One last steep climb brought us out to the hanging valley of Dilberdüzü, a broad green grassy flat, split by a rushing stream and backed by the sheer rocky ramparts of the main range. 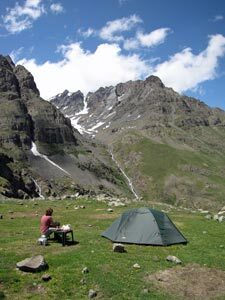 In full trekking season, Dilberdüzü can have more than 50 tents scattered on its grassy flats. We were fortunate to find only one other tent, plus a couple of brand new stone-walled toilets, functionally sound if bodgily built. 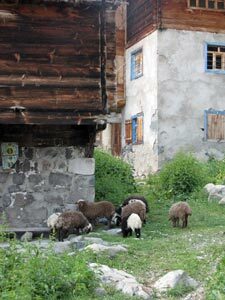 Creature comforts were creeping in to the high Kaçkars. 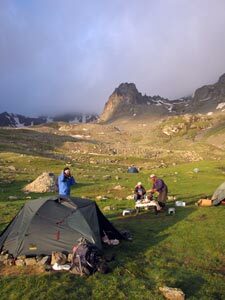 We set up camp and had a late lunch, looking out over the 3600m peak of Kaçkar Zirve, on a spur of the main mountain. 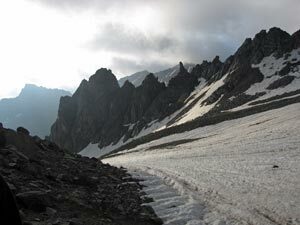 The summit of Kaçkar itself was hiding behind the dark walls of Seytan Kayalari (Satan's rocks) rising up to the north of our grassy flat - we would have to wait for the start of the ascent next morning to see it. The afternoon passed slowly and pleasantly in this beautiful alpine setting. 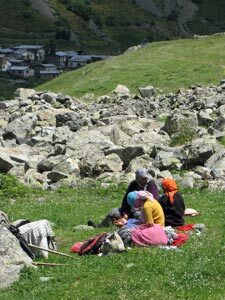 A trio of Turkish trekkers dropped in to our campsite on their way down from the mountain for a çay and a chat – their description of the views made us even keener for the climb tomorrow. It was only 4.30pm when the sun disappeared behind the ramparts and the temperature dropped dramatically in 10 minutes. Time for down jackets and beanies – at least we got a chance to wear them after carrying them around Turkey for 7 weeks! It was also time to get stuck into Makşur's hearty dinner. Later that evening, we shared a bowl of hot soup and chatted to the Polish couple from the other tent - they had also also just climbed the mountain - and two Americans, who had just arrived and, like us, planned to do it the next day. 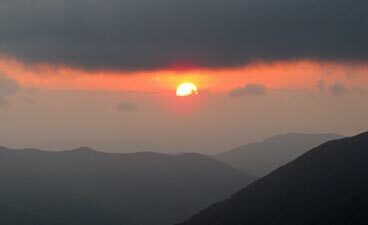 However, on cold mountain nights you retire early and we were soon snuggled into our sleeping bags. 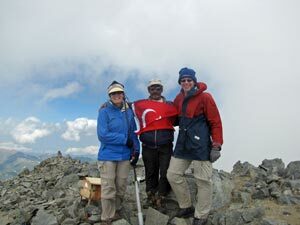 A slight rustling from the direction of Makşur's tent announced the arrival of Ibrahim, our guide of yesterday. He had walked up late in the day and tomorrow would be the one to take us to the summit. Our sense of anticipation was rapidly building up. 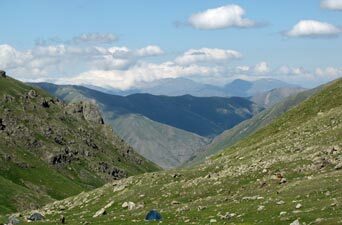 “Kahvasi – besh”, Makşur had told us before we crawled into our tent to sleep. 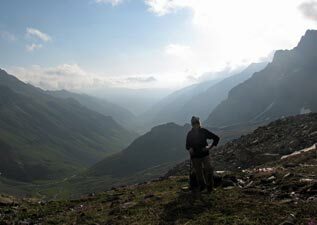 I wished that with my smattering of Turkish words that I hadn’t understood – breakfast at 5am did not really appeal, but you need to start the climb of Mt Kaçkar early, as it has a reputation for clouding over in the afternoons. Still, after a night spent on 5mm foam mats, we were glad to get up. Our hips, spoilt by a 20mm thermarest when we camp at home, woke us up to complain regularly and at the best we got an hour or two’s sleep. The star-filled sky that we left when we crawled into our tent had been replaced by low cloud which hung about the peaks. We weren’t sure what to expect of today. 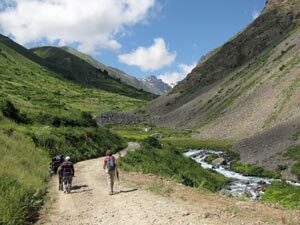 By 20 to 6 we were on the way, with Ibrahim leading us up and out of the camping area to start a long and steep climb beside the stream that tumbled down from the snow fields above. As we zig-zagged upwards, the mists above began to break up a little and by the time we reached the fluted drifts funnelling down between jagged black rock ribs, the sun was breaking through. Ibrahim had timed his run to perfection. 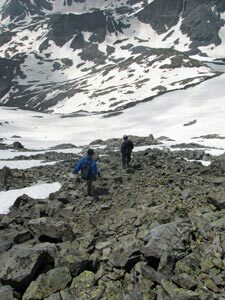 We crossed the strangely rippled snowdrift, to climb up rocks to the next level, then more snowdrifts and more rock. 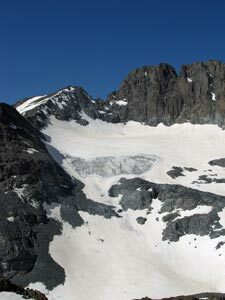 The pattern for our climb was quickly becoming apparent. As we pushed on through this monochrome landscape of snow and rock, cloud drifted by, hanging over the valleys or wrapping itself around the ranges on the far side. 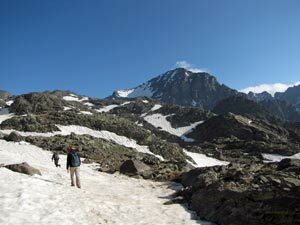 For the moment though the route ahead was clear and, with one more trudge up a snowdrift, we reached the magnificent site of Deniz Gölü, a large glacial lake surrounded by sharp peaks and jagged ridges. 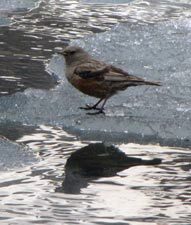 Even though summer had well and truly started, the lake was almost completely frozen over. It was a good spot to sit and absorb the grandeur of these mountains for a while before heading on. 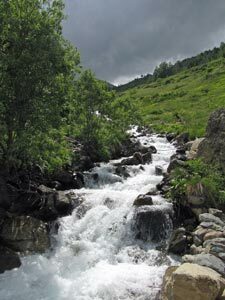 Meditational moment over, we rock-hopped across the mouth of the stream flowing out of lake to climb a large knob of jumbled lichen-spattered boulders. 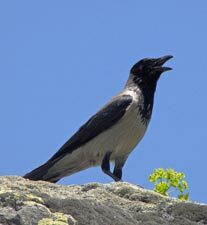 From the heights above the lake we could see the dark rocky summit of Kaçkar for the first time – my, it looked high! Then it was back into the snow, still crisp in the early morning cold. It crunched beneath our feet as we sought out rock islands in this white sea, before traversing upwards across a steep snowdrift. 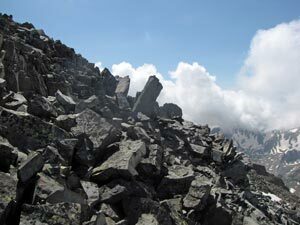 The end of the climb brought us to a saddle with a long cornice between two rock pillars. We looked over its edge to see a very steep drop-off and the route heading off from its base – the question was how to get to it. 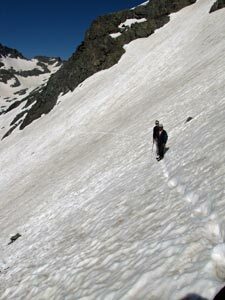 After a quick reconnoitre, Ibrahim found the route down a rocky spur at the side of the cornice and when the spur ran out, it was directly down the snowy face. 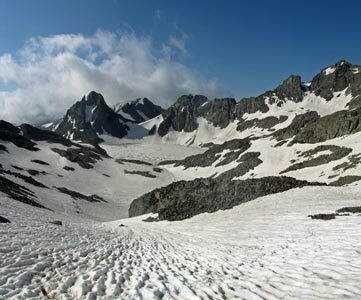 We had lost almost 100 preciously gained metres. 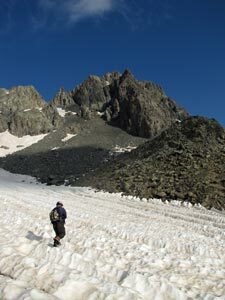 Ahead lay what looked like a morain of basalt boulders, which helped us regain some of them before we once again headed across a bowl of snow that swept down from the rock faces and funnelled into the gullies below. Looking at these huge snow-filled bowls, we could see why all the streams pouring off the mountains were so swollen with meltwater. 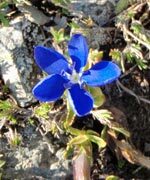 Glancing behind at one particularly steep, north facing slope, we could see a patch of bluish ice – one of the glaciers revealed. Another steady climb traversing a snow bowl brought us to a small cliff face, where we needed to do some rock-scrambling across the face of a trickling waterfall. 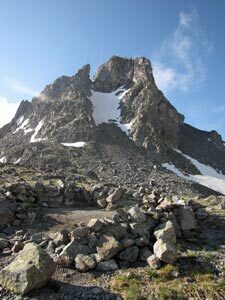 We were now only 400m below he summit and, looking up, we could see the general route to it – 200m up a steep snow slope (and a lot further down if you slipped) followed by another 200m of scrambling over the sharp-edged boulder jumble that led you to the top. 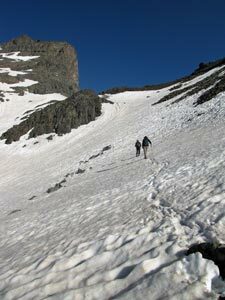 Luckily we had Ibrahim to plot our way carefully upwards across snow and over boulder. Below us we could see the tiny forms of the two Americans who had left later and were following our path – they were in luck today, because in these snowy conditions it would be very difficult to find the way without a guide. 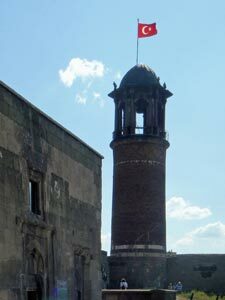 The fair Nello was the first to spot the Turkish flag marking the summit when we were some 40m below it. 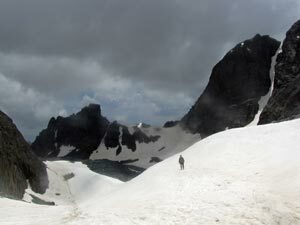 However, before making the final ascent, we stopped to put on windproof gear, gloves and beanies as the icy wind was now whipping over the exposed slopes. A few more steps and, after 4.5 hours and 1100m of climbing, we were there, at 3937m on top of Mt Kaçkar and the whole Kaçkar Mountains. We signed the register, took the obligatory summit photos and took in the views. They say that on a clear day you can see Mt Ararat, but today wasn’t that day. 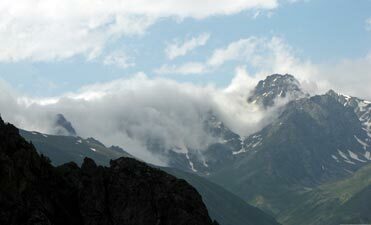 Cloud was swirling about, occasionally obscuring neighbouring peaks, but with gaps opening up to show these wild mountains in their full splendour. 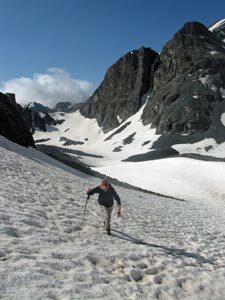 We could look down into the valleys of the north side and east and west along razor-sharp ridges and over snowy bowls, glacial lakes and towering rock pillars – the reward was well worth the effort we had expended to get here. We were soon joined by the two Americans, but with the icy wind finding its way through our clothing, it was time to head back down. 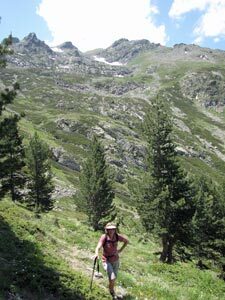 The route down was in some ways just as demanding – not energy sapping, but more adrenalin, as we picked our way back down the boulder screes and down the steep snow bowls, now much softer as the sun worked its magic. The fair Nello did a perfect 30m slide when she slipped off a snow traverse while I buried one leg up to the thigh in a section of very soft snow. 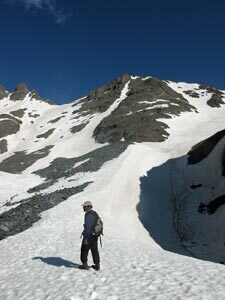 Apart from that and wet feet from bootfulls of snow, the descent was uneventful. 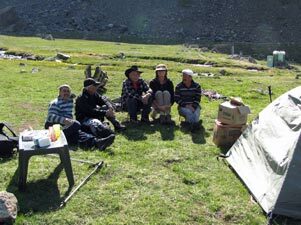 A leisurely lunch on the edge of frozen Deniz Gölü, a long zig-zagging descent from plateau to campground and we were back. 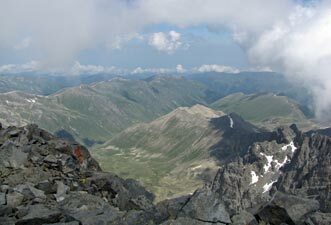 Makşur had a pot of hot cay waiting, which in the absence of Efes was a good way to celebrate the climb. The days weather went from curious to curiouser – from the cloudy start, we ended up with very special views from the mountain top. We were lucky, because an hour later, the cloud had engulfed the summit. 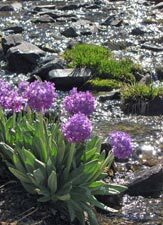 On reaching the campground the sun was shining brightly again on summit and camp, yet an hour later, while taking an afternoon siesta we were woken by the sound of thunder and then hail falling on the tent fly – how warm we felt inside. Makşur’s giant-sized dinners continued, so tonight we shared it with a Hungarian couple who had arrived at the campsite drenched by the storm. It was good to enjoy the camaraderie of trekkers, but the storm had caused the temperature to drop and the cold wind seeped through, so it was early into the tent, hoping that tonight we might sleep the sleep of the physically exhausted, despite the thickness (or lack thereof) of the mat beneath us. 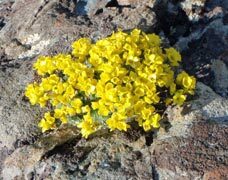 Despite the weather antics of the previous evening, the sun shone brightly again next morning. 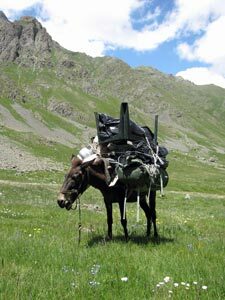 After packing up our campsite, we were off back down the track to Yaylalar, with Makşur and his loaded up mule in hot pursuit. 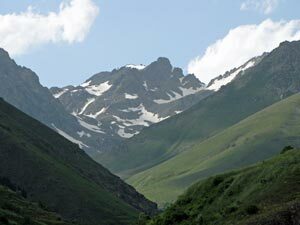 We headed quickly down the long green-walled glacial valley, as cloud formed and dissipated on the peaks around. Makşur and the mule soon caught us, just in time to watch us get our boots full of water crossing a side stream, and soon raced ahead. A mule on the way home is hard to beat. 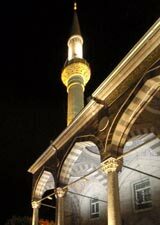 However, it had its advantages, as Makşur stopped off at the çay shop in Olgunlar and a fresh brew was waiting for us when we arrived. 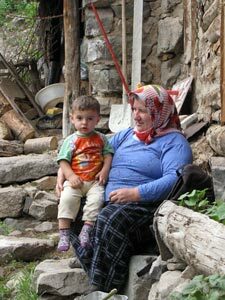 From Olgunlar on, we were back in civilisation, people about the daily business that keeps the traditional life of a Turkish mountain village ticking over - a slower and more peaceful life that we of the modern technology driven world have forgotten. 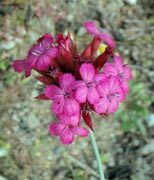 The last few kilometres were just a steady walk down the road to Yaylalar, breathing in the scent of freshly scythed hay-fields and the wildflowers lining the road verge. 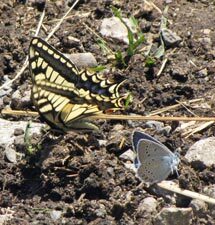 We strolled through clouds of butterflies - blues, whites, oranges and yellows - fluttering in the warm morning sun. 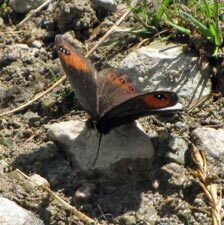 If anywhere should be called Butterfly Valley in Turkey, it is here, not on the Mediterranean coast. All too soon, the road dipped sharply and we were back in Yaylalar - time to have a hot shower before lunch, and a quiet afternoon washing and mending torn trousers etc. 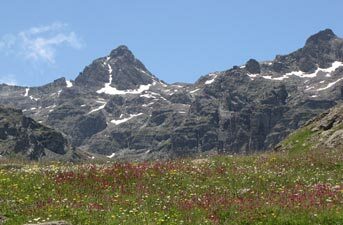 Tonight we would have a nice comfortable mattress and a chance for a good sleep, dreaming of our climb up Mt Kaçkar. 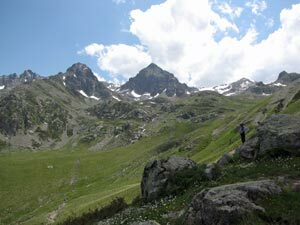 Tomorrow, it would be time to leave the southern side of these mountains and cross the range to the north – another early morning rise, I fear.